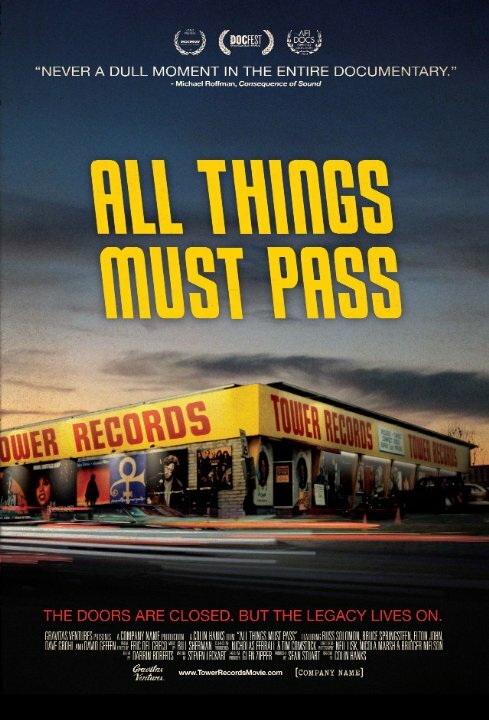 The music documentary All Things Must Pass: The Rise and Fall of Tower Records is opening at the Bloor Hot Docs Cinema this weekend, tickets and showtimes can be found right here. Founded by Russ Solomon in the back of his father’s convenience store, Tower Records blossomed into the premiere place for music lovers throughout the second half of the 20th century. Tower Records opened locations around the world and became a retail giant, even attracting the attention of rock stars like Bruce Springsteen, Dave Grohl and Elton John, who frequently went there to browse through the stacks and stacks of vinyl. The stores received a resurgence with the dawn of CDs, but were ultimately plunged into bankruptcy when digital downloading completely changed the recording industry in the late 1990s. Directed by Colin Hanks, who harbours a clear affection for the material, All Things Must Pass: The Rise and Fall of Tower Records is a smoothly assembled film that not only takes us behind the scenes of the store, through interviews with passionate former employees and the freethinking founder, but also charts the constantly evolving music industry that was intrinsically linked to the retail franchise. This is an engaging and ultimately bittersweet look at the birth and death of an entire era, that evokes powerful feelings of nostalgia for those of us who understand the profound joy of browsing through a record store, and still have a soft spot for our physical music collections.